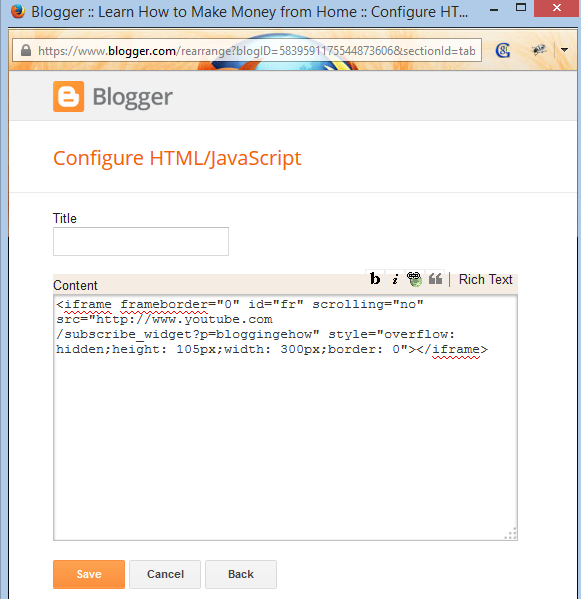 How To Add a YouTube Subscription Widget To Blogger - 1 Step! If you've a YouTube channel you'd definitely be willing to increase your audience and subscribers fast. There are couple of strategies for that and the most basic and logical is to create quality, well edited videos that people would like to see. I'll leave that to another post, though for today, we can implement a subscription widget on our blogs/websites that would encourage your blog readers to subscribe to you if you're running a YouTube channel. Lets get right into the steps that would help you add a YouTube subscription widget to your blogger blogs. Simply replace the text in orange with your YouTube username and it's all ready. Hit Save and you're all done. You may like to read now: Uploading Videos Directly To Facebook Vs Sharing YouTube Videos? - Which Gets More Interaction? BloggingeHow | Making Blogging Simpler: How To Add a YouTube Subscription Widget To Blogger - 1 Step!